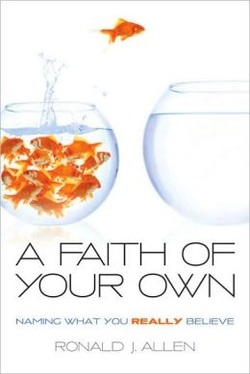 Our new Bible study is centered on A Faith of Your Own by Ronald J. Allen. It is available on Kindle and Nook, or in paperback. If you would like the paperback, please contact the church office by phone at 635-3289 or by e-mail here and let us know so that we can order books. The group is open to both men and women of any age. We will meet on the stage in the Fellowship Hall every Sunday at about 11:10, after everyone has a chance to stop at Coffee Hour first.